Mario Scalini, state supervisor of fine arts for Modena and Reggio Emilia, was doing inventory of the tens of thousands of art pieces in storage in his area when he found a small portrait of a lady framed by a beautifully elaborate gilded 17th century frame in the vault of the ducal palace of the Este family in Sassuolo, outside of Modena. He immediately noted the high quality of the painting. The piece was thought to be an 18th century copy of the head of the Madonna in Rafael’s famous Holy Family of the Pearl now in the Prado museum, so Scalini found its exceptional quality incongruous. Also, why would a mere 12 by 16-inch copy be put in such a large, sumptuous frame? He followed up on his hunch that this might be an actual Raphael by digging through the ducal archives for any reference to the portrait. He found nothing about a copy, but he did find an inventory reference from 1663 to a “portrait of a woman” by Raphael. There is no record of the Raphael portrait currently in the collection, nor was there any trace of it having been ceded to the Elector of Saxony in 1746 when Francesco III d’Este had to sell many of the most valuable pictures after he was bankrupted by the Wars of the Spanish, Polish, and Austrian Successions. There was no record of it being loaned or dispersed at any other time either, so it seems the Rafael was squirreled away somewhere and forgotten, maybe to be mistaken for a copy decades later. The art official sent the 12 by 16 inch (30 centimeter by 40 centimeter) work to a laboratory in Florence, where one of the experts who ran scientific tests on the painting, Anna Pelagotti, said infrared testing revealed three layers underneath, including a preparatory design. “It was a beautiful sensation, our mouths dropped open,” said Pelagotti, describing the reaction she and her fellow experts had when the saw the sketch. “It looked more Raphael” than one could imagine, Pelagotti marveled, adding, “you could see his hand” in the finely detailed sketch. The testing also indicated two restorations done in the 17th and 19th centuries. Obviously that means it can’t be an 18th century copy, and it also means the original was highly esteemed, enough to make it worth restoring over the centuries. 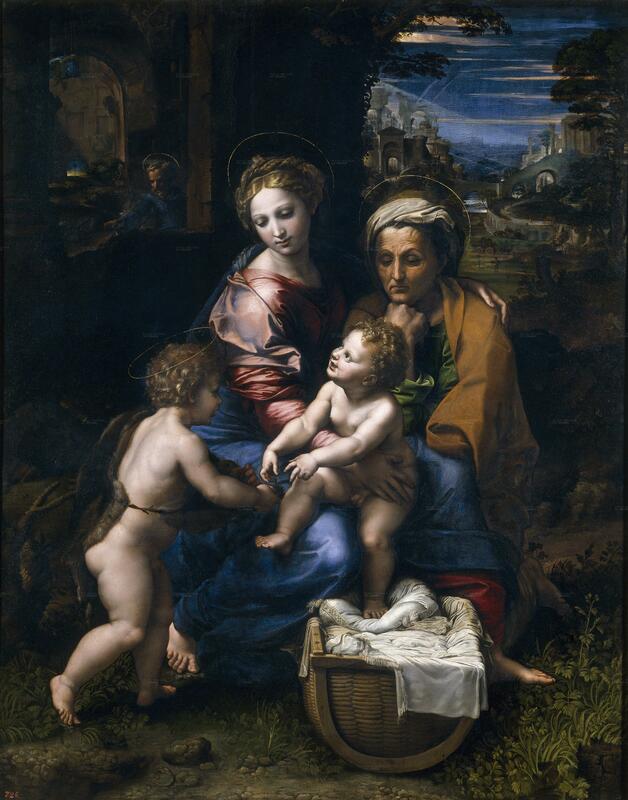 Scalini doesn’t want any paint samples taken for testing because he doesn’t want the small piece damaged in any way, so the next step is to ask the Prado if they’ll loan him the Holy Family for comparison purposes. The Holy Family is known as “La Perla” because King Philip IV of Spain considered it the pearl of his art collection. 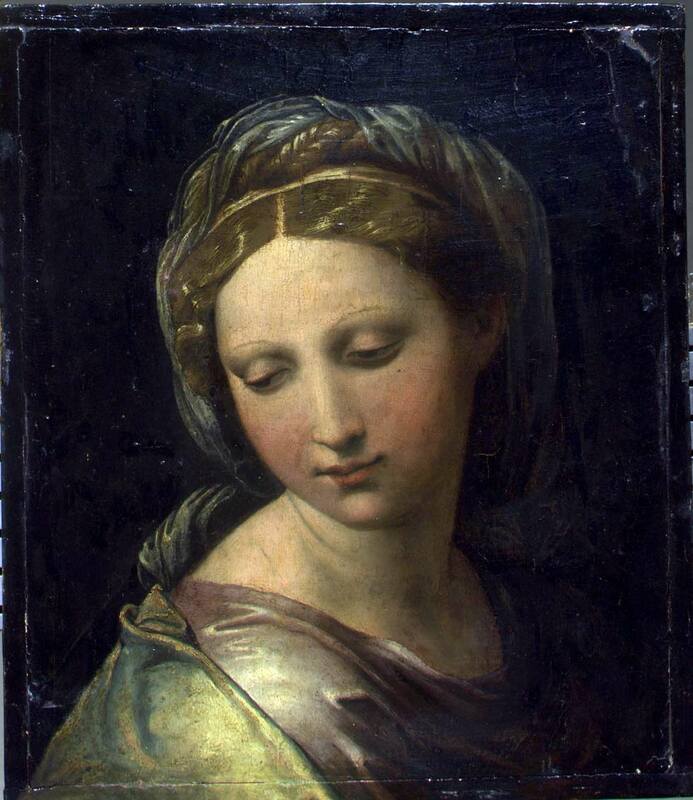 Raphael did a sketch of the painting before he died, but left it to his pupil Giulio Romano to finish. If the Modena portrait is authenticated as done by the master himself, then the sketch and the portrait is all we’ll have in his hand of the Holy Family. The final word will have to come from art historians examining both pieces with expert eyes, but for now, all signs to point to this portrait being one of Raphael’s last paintings, the original Madonna of one of his greatest masterpieces. This entry was posted on Sunday, May 9th, 2010 at 10:04 PM	and is filed under Renaissance, Treasures. You can follow any responses to this entry through the RSS 2.0 feed. You can skip to the end and leave a response. Pinging is currently not allowed. Excellent essay, M. Thank you kindly for linking to it. I love his analogy of the rarified art verification team swooping in like the profilers in Criminal Minds. Cheers for the link M! I would be interested to know what this crack team of Art Historians are going to use in the absence of a pigment sample? Subjective techniques can only go so far… and are at the end of the day… subjective! That being said, exciting stuff nonetheless – it’s not everyday we get Raphael related news. Fabulous news Liv! How I would love for this to be verfied as the work of Messer Sanzio. How fabulous to feel the touch of the Old Masters in the 21st Century… I can just imagine the thrill the researchers felt when they viewed the IR scan – preparatory sketches tell can tell us so much about the actual progenitor of the image. This actually bears alot of similairity to the case of the ‘The de Brecy Tondo’ and Raphael’s Sistine Madonna. True that, although the de Brecy Tondo had the advantage of paint analysis which made precise dating of the pigments possible. In this case, even if we can confirm the sketch was Raphael’s, it could be the only thing Raphael did himself. The painting itself could be a student’s work. I suspect we’ll never know for sure.